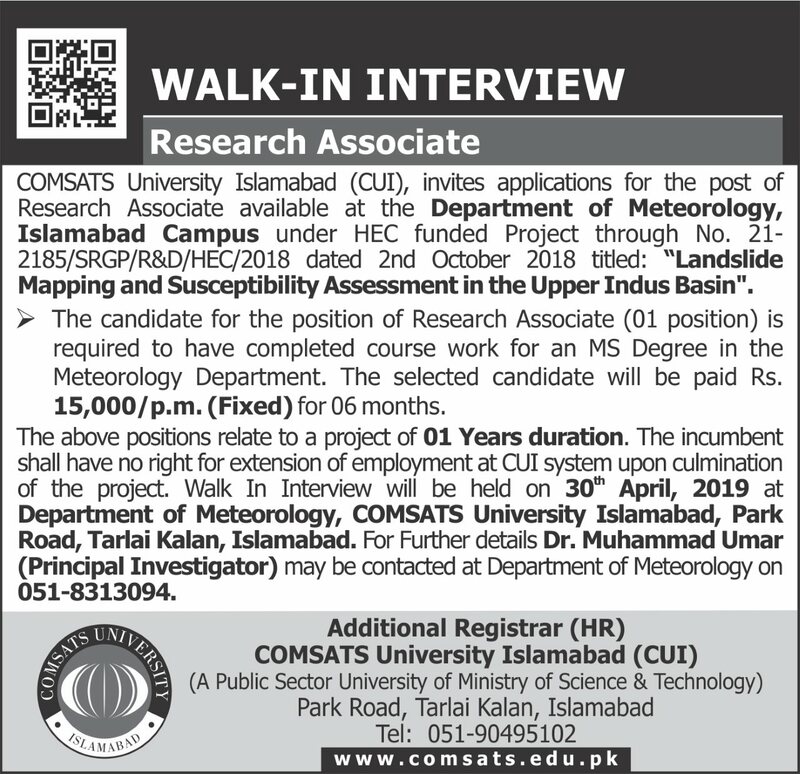 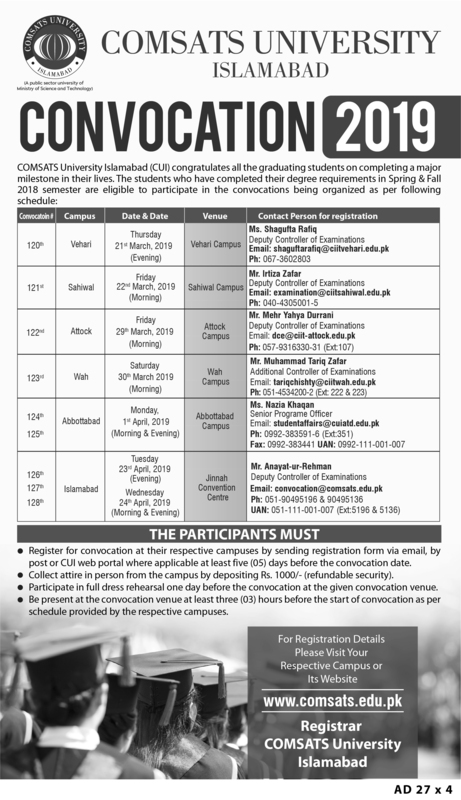 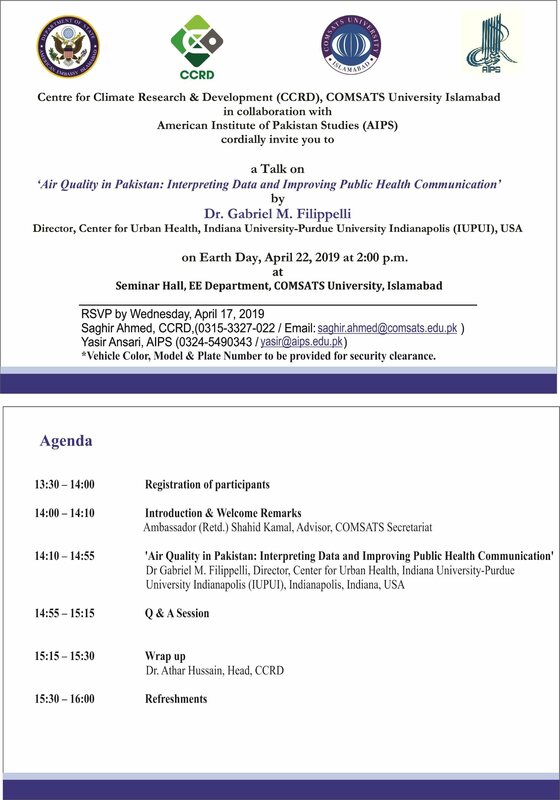 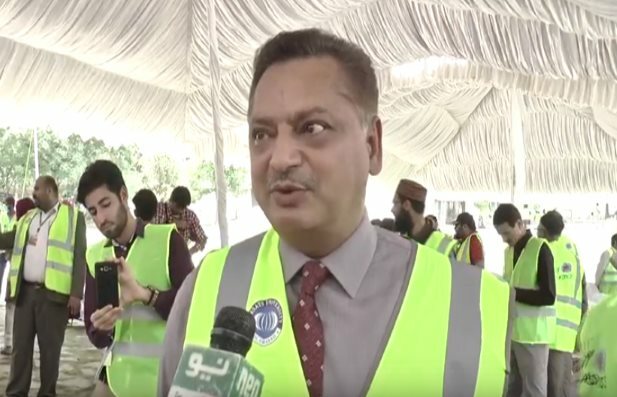 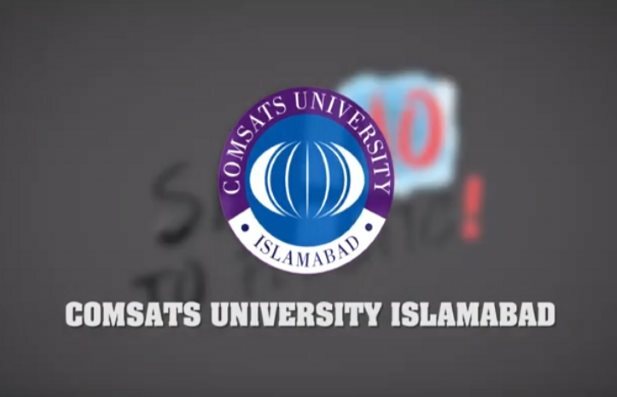 Dr. M. Umer - Research Associate(Position Vacant) - Department of Meteorology Islamabad - "Landslide Mapping and Susceptibility Assessment in the Upper Indus Basin." 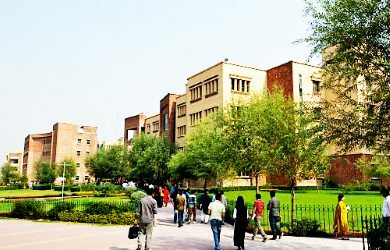 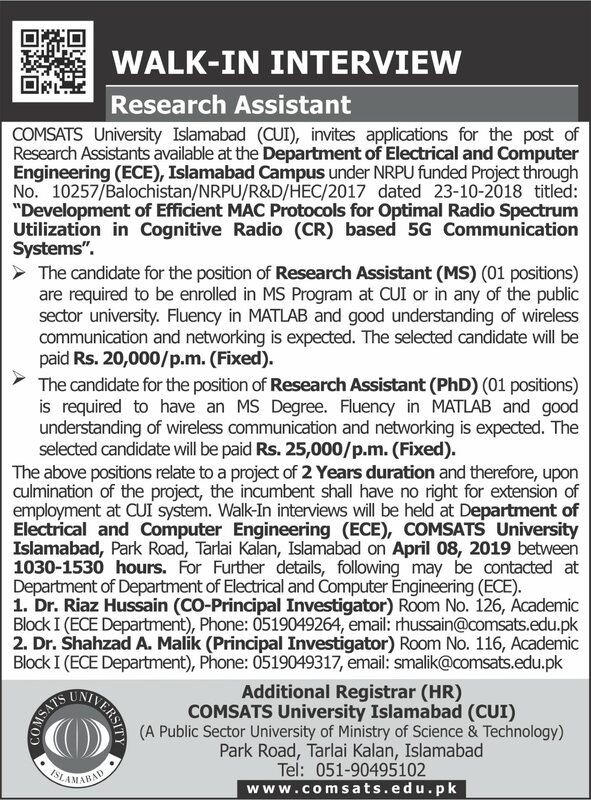 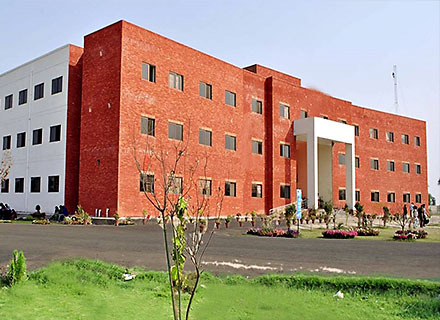 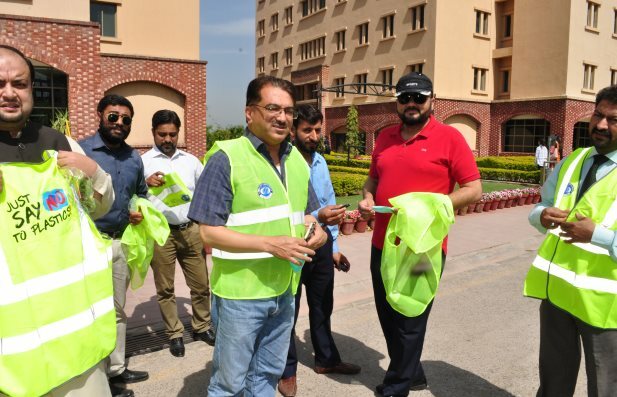 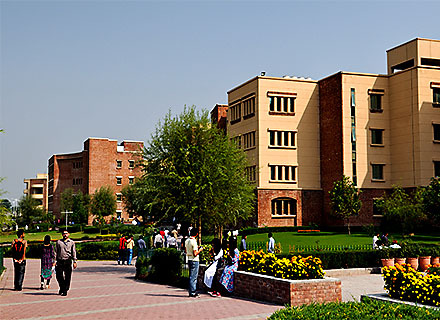 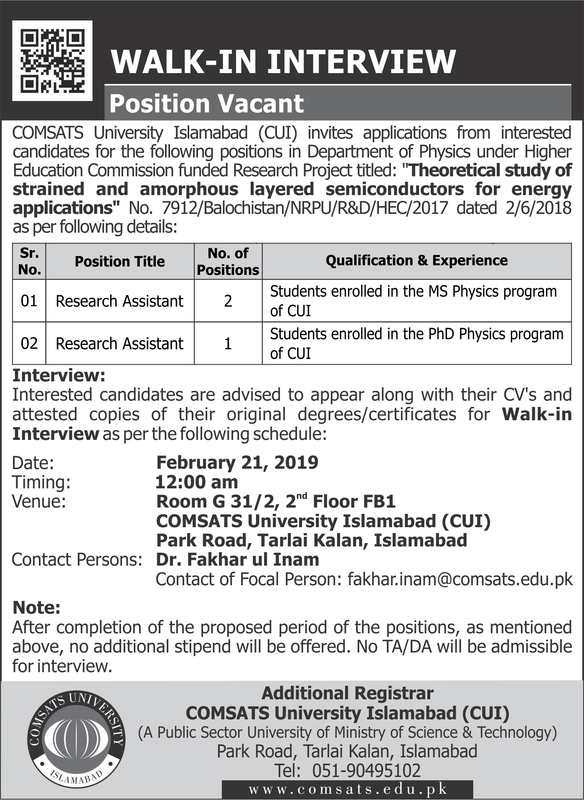 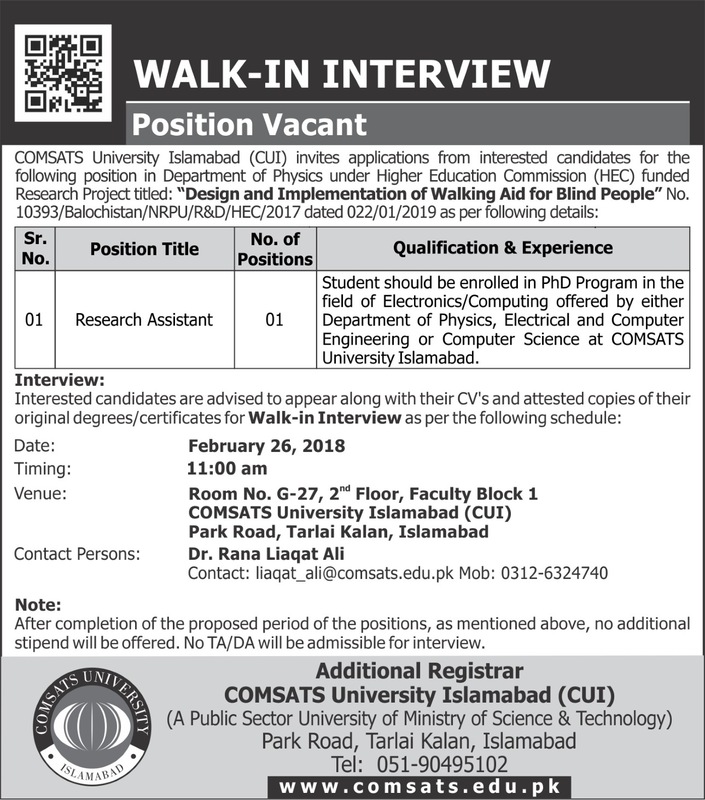 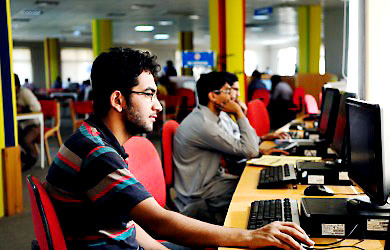 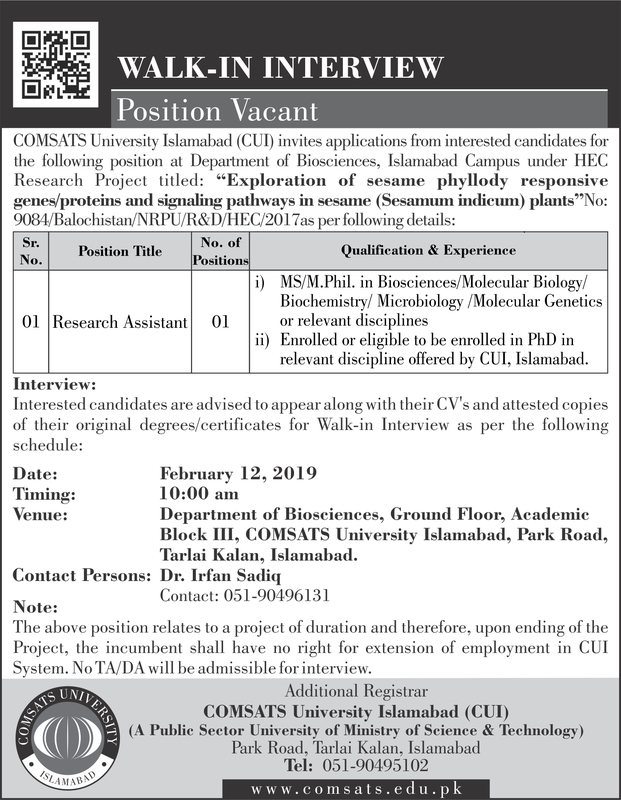 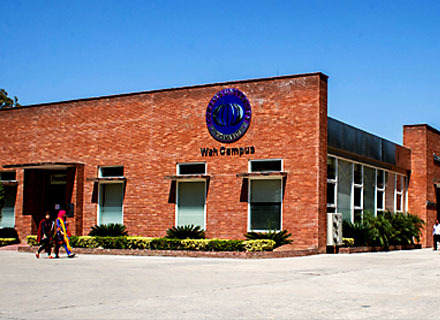 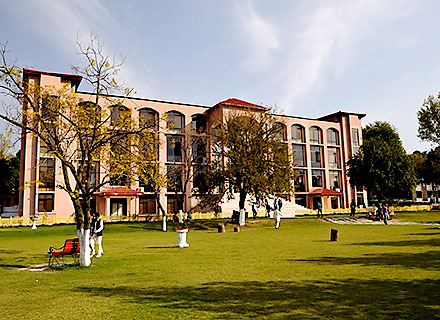 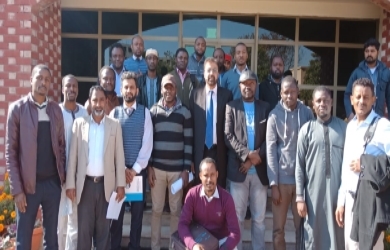 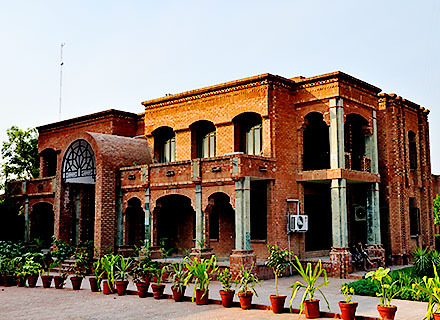 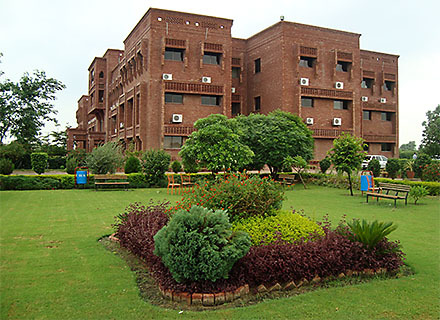 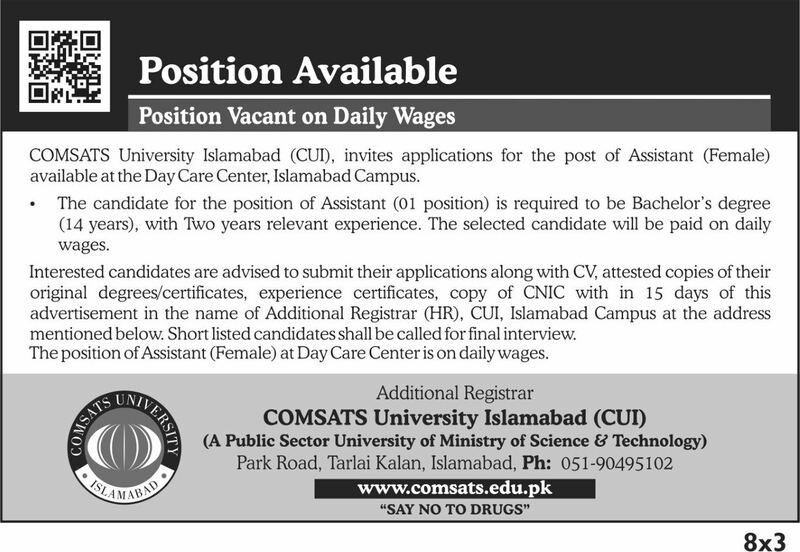 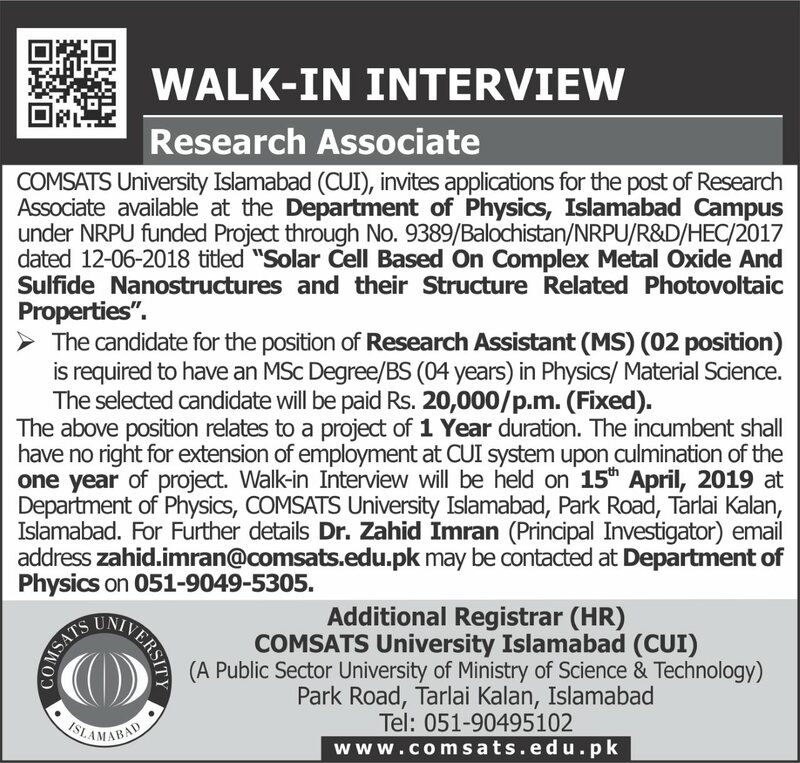 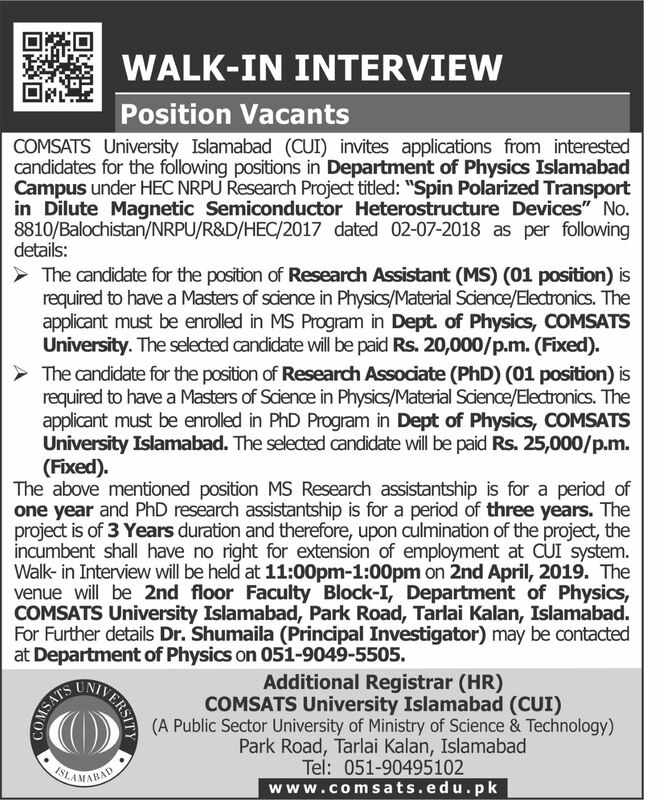 Dr. Zahid Imran - Research Associate(Position Vacant) - Department of Physics Islamabad - "Solar Cell based on Complex Metal Oxide and Sulphide Nanostructures and their Structure Related Photovoltaic Properties." 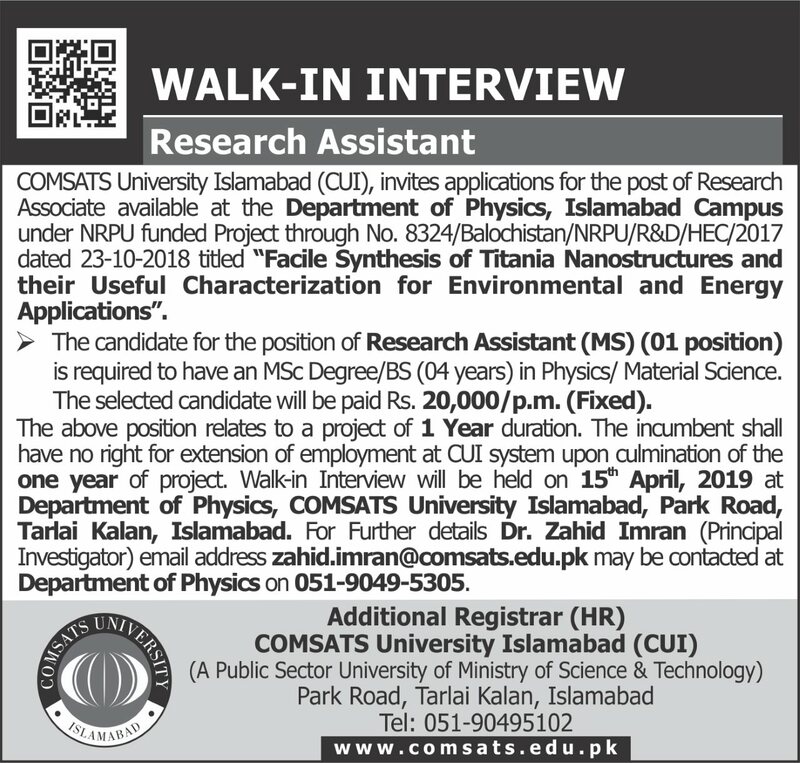 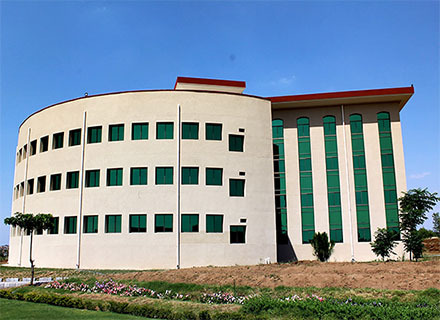 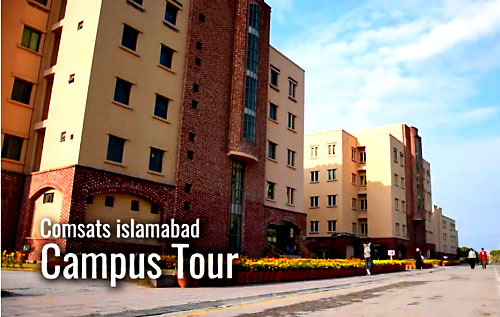 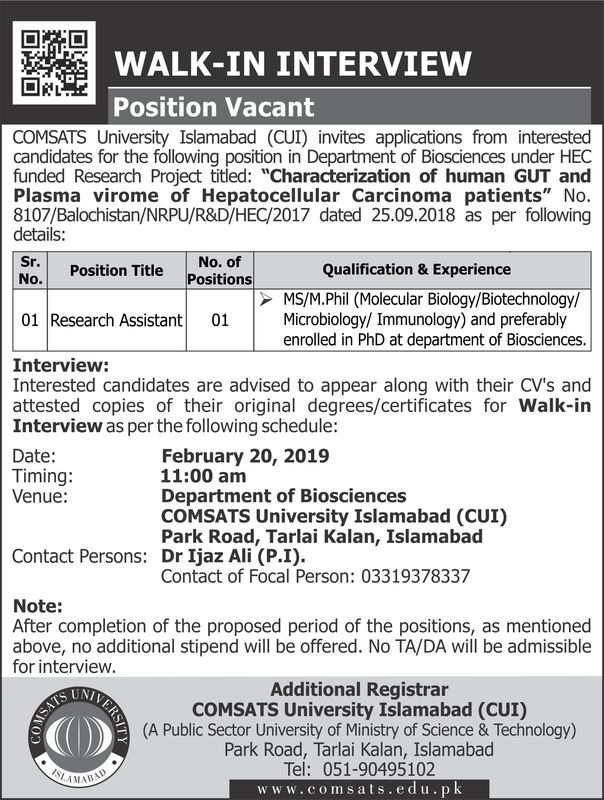 Dr. Zahid Imran - Research Assistant(Position Vacant) - Department of Physics Islamabad - "Facile Synthesis of Titania Nanostructures and their useful Characterization for Environmental and Energy Applications." 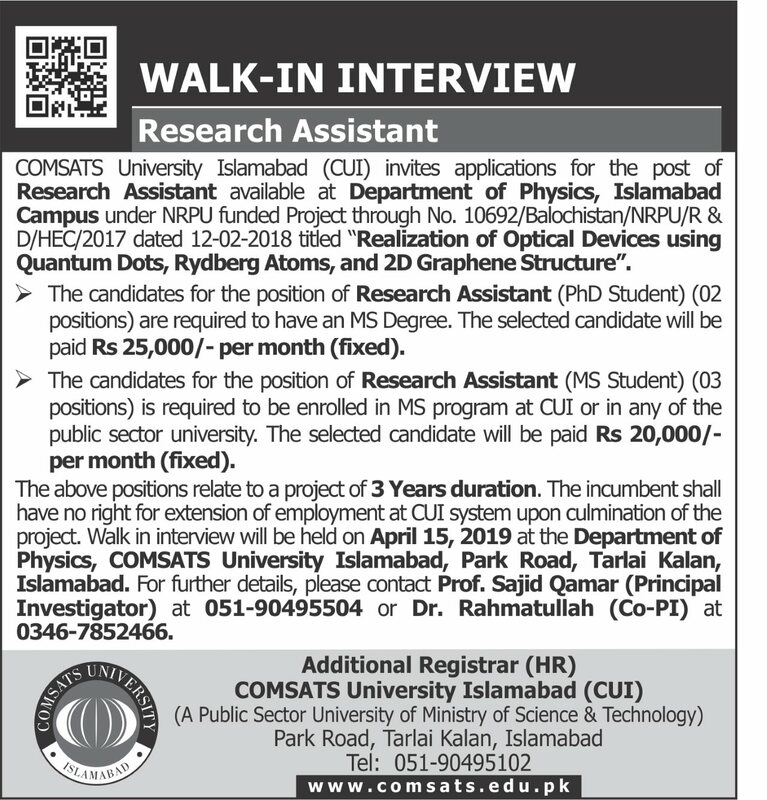 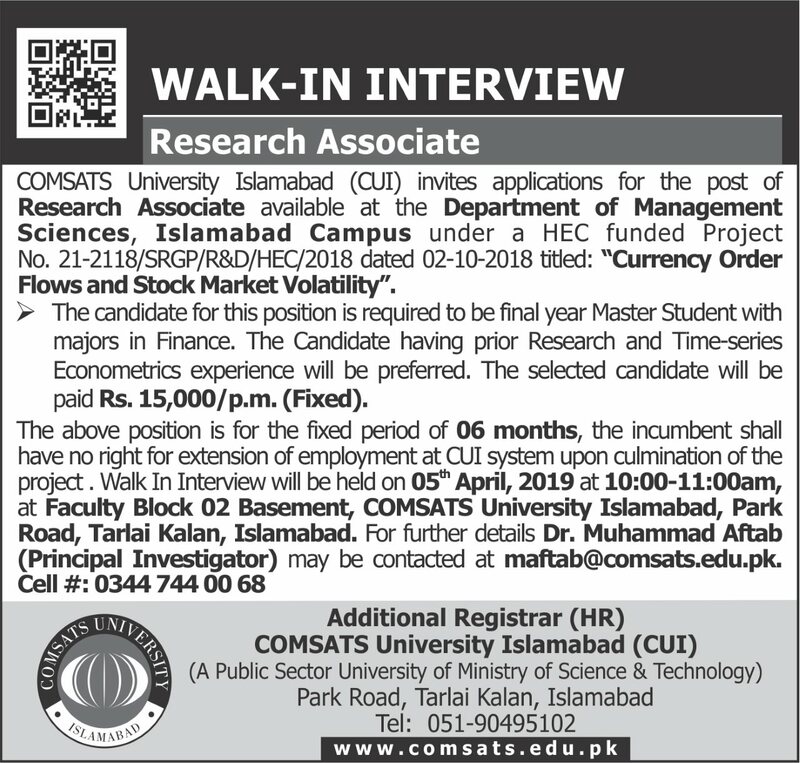 Dr. Sajid Qamar - Research Assistant(Position Vacant) - Department of Physics Islamabad - "Realization of Optical Devices using quantum dots, Rydberg Atoms, and 2D Graphene Structure"
Dr. M. Aftab - Research Associate(Position Vacant) - Department of Management Sciences Islamabad - "Currency order flows and stock market volatility"
Dr. Riaz & Dr.Shahzad - Research Assistant(Position Vacant) - Department of Electrical and Computer Engineering Islamabad - "Development of efficient MAC protocols for optimal radio spectrum utilization in cognitive radio (CR) based 5G communication systems." 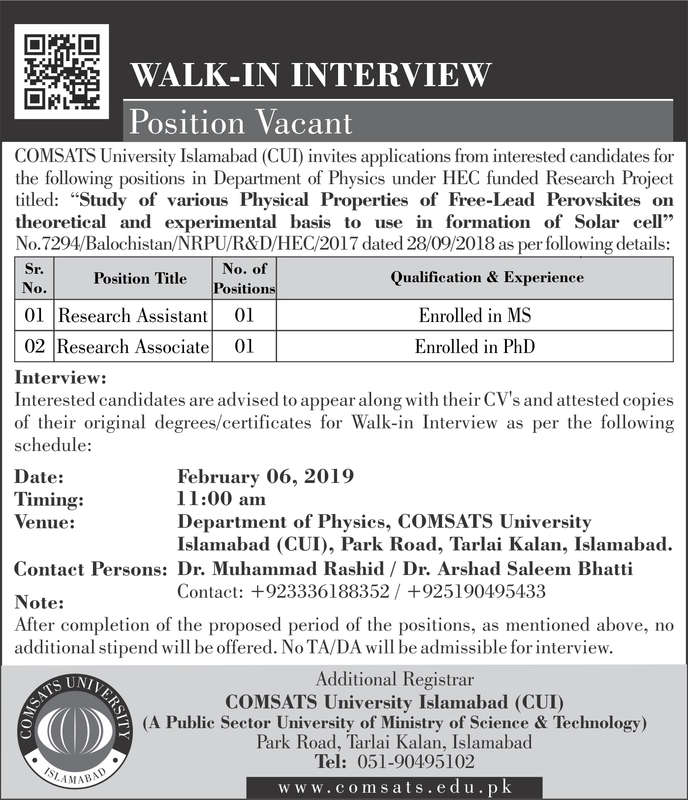 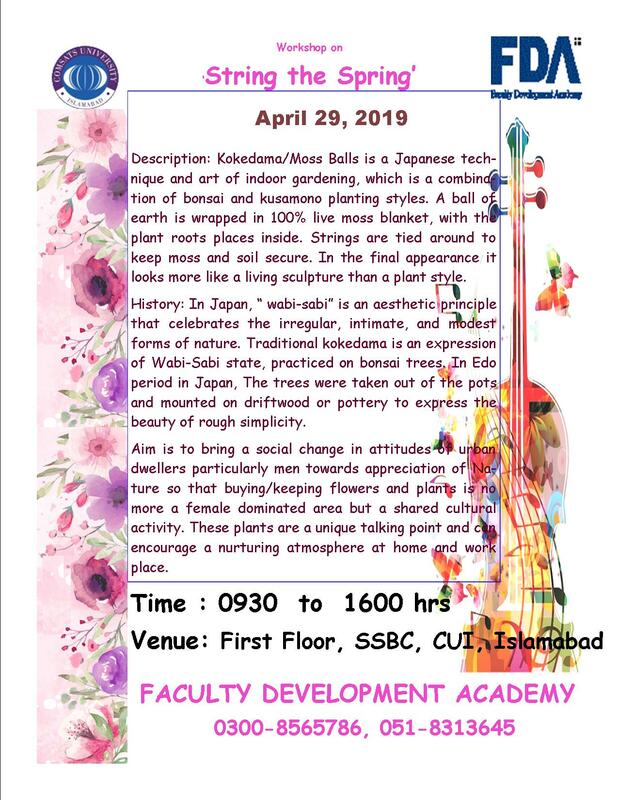 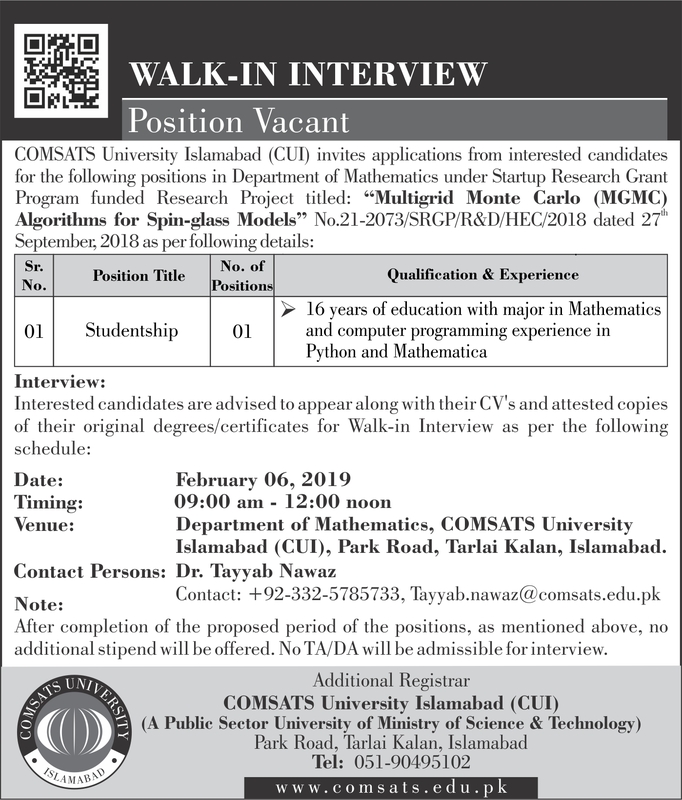 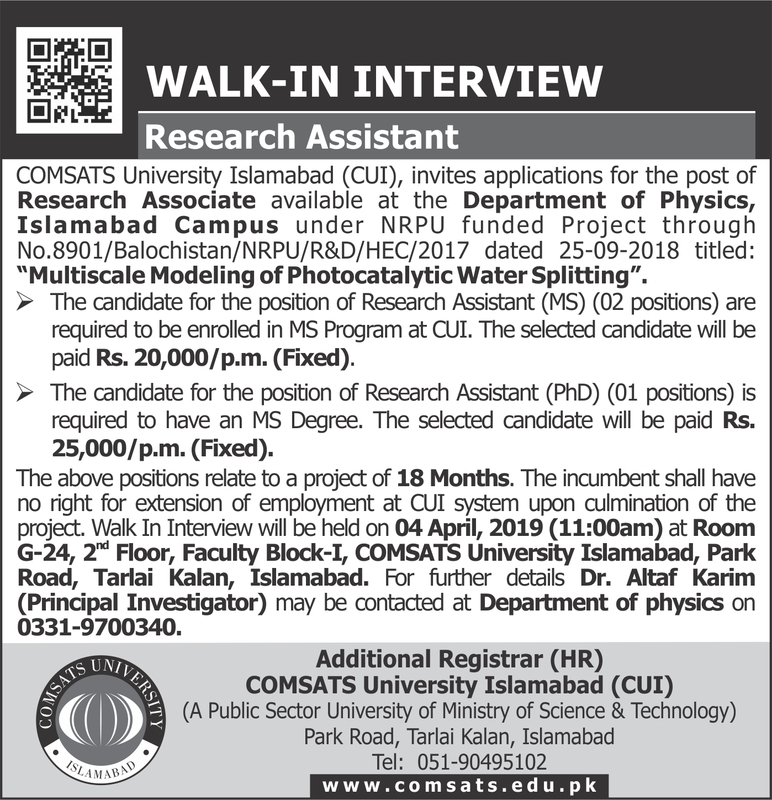 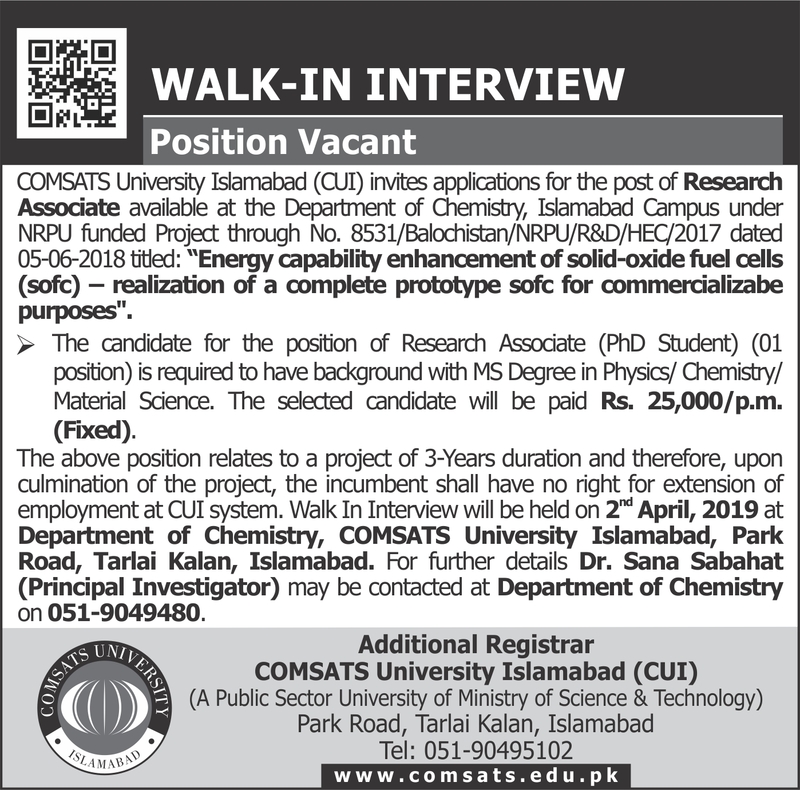 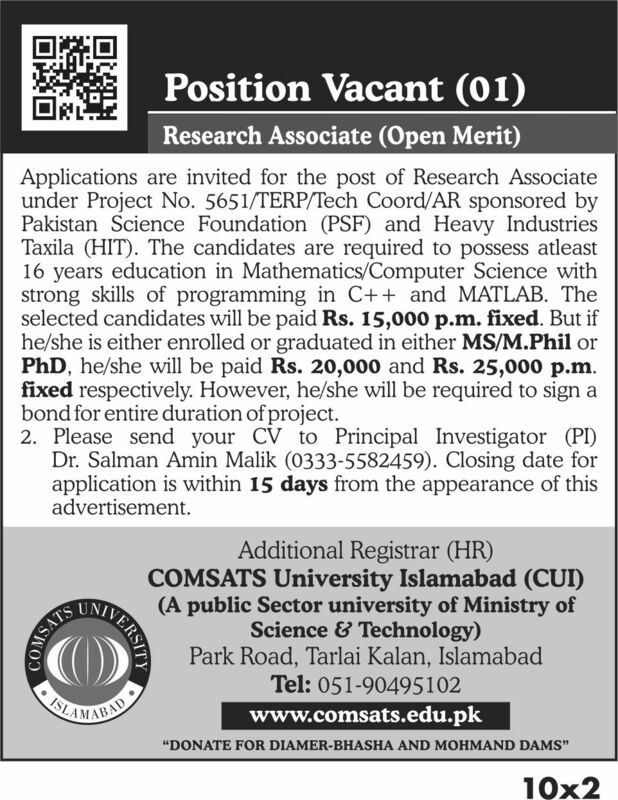 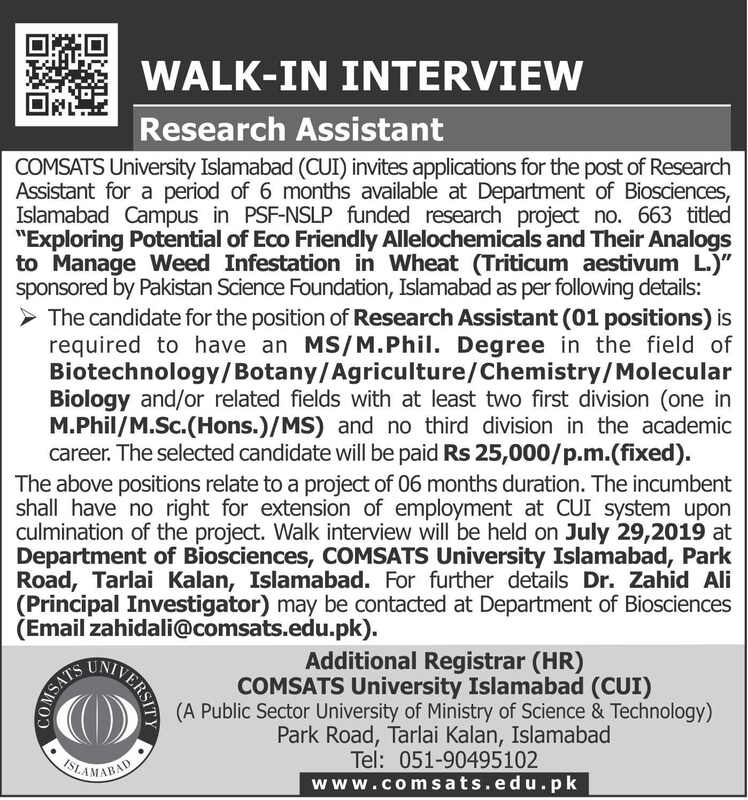 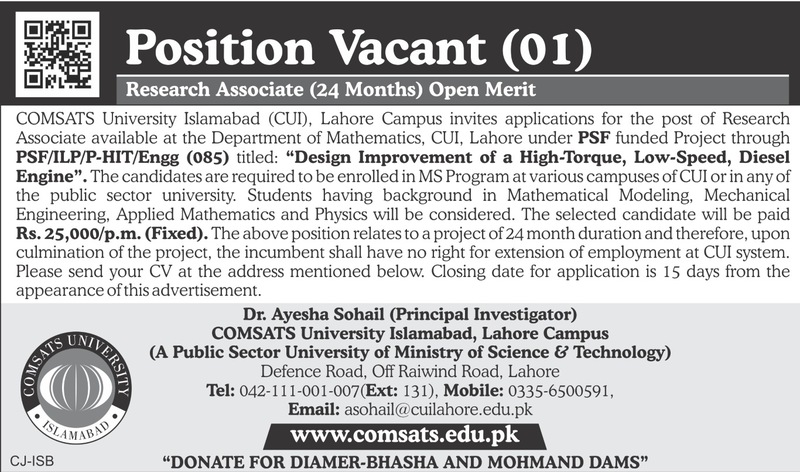 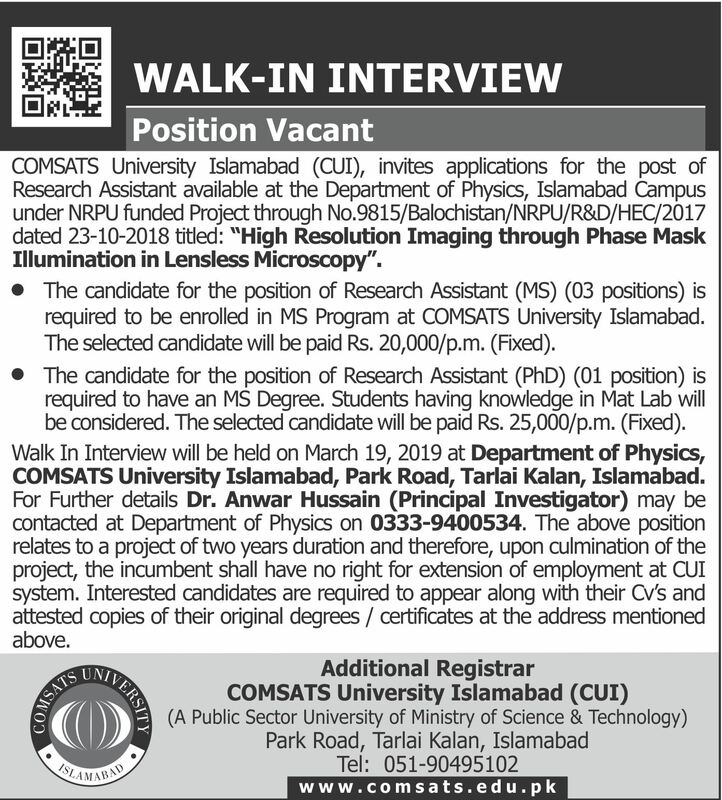 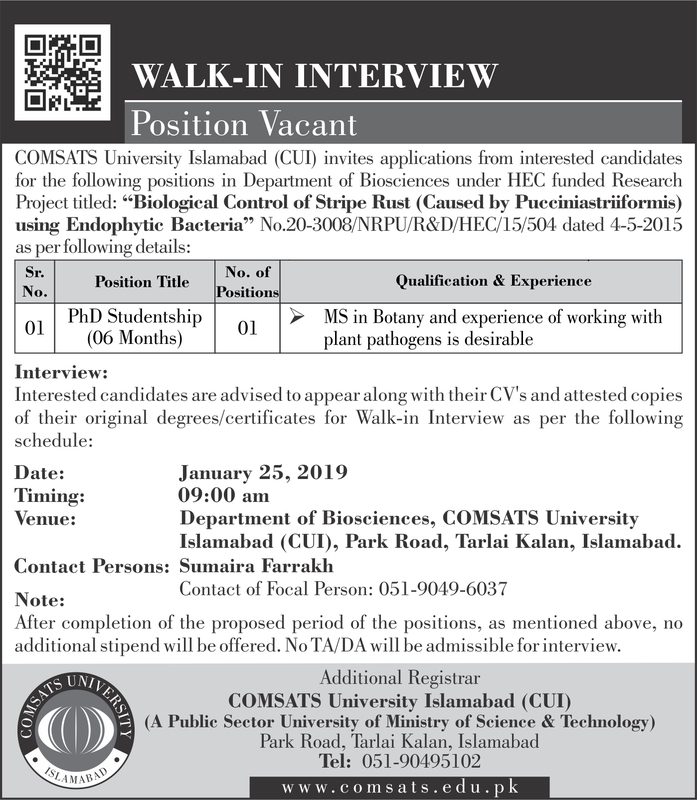 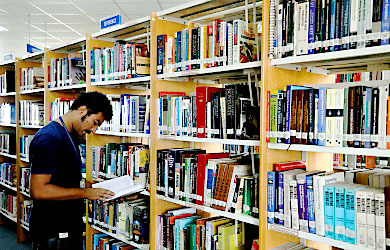 Dr. Altaf Karim - Research Associate(Position Vacant) - Department of Physics Islamabad - "Multiscale modeling of photocatalytic water splitting"
Dr. Shumaila - Research Assistant(Position Vacant) - Department of Physics Islamabad - "Spin polarized transport in dilute magnetic semiconductor heterostructure devices"
Dr. Sana Sabahat - Research Associate(Position Vacant) - "Energy capability enhancement of solid-oxide fuel cells (sofc) - realization of a complete prototype sofc for comercializable purposes"
Dr. Anwar - Position vacant (Research Assistant) - "High Resolution Imaging through phase mask illumination in lensless microscopy"
Dr. Rana Liaqat Ali - Position vacant (Research Assistant) "Design and implementation of walking aid for blind people"
Dr. Zahid Ali - Position vacant (Research Assistant) "Development of baseline protocols to predict climate change impacts on plants and prevalence of associated alergic diseases in Pakistan"
Dr. Ijaz Ali - Position vacant (Research Assistant) "Characterization of human GUT and plasma virome of hepatocellular carcinoma patients"
Dr. Fakhar-ul-Inam - Position vacant (Research Assistant) "Theoretical study of strained and amorphous layered semiconductors for energy applications"
Dr Irfan - Position vacant (Research Assistant) "Exploration of sesame phyllody responsive genes/proteins and signalling pathways in sesame (Sesamum Indieum) plants"
Position Vacant "Multigrade Monte Carlo (MGMC) Algorithms for Spin-glass Models"
Dr. Rashid (Physics) - "Study of various physical properties of free-lead perovskites on theoretical and experimental basis to use in formation of solar cells"
WALk-IN Interview "Biological Control of Stripe Rust (Caused by Pucciniastriiformis using Endophytic Bacteria)"